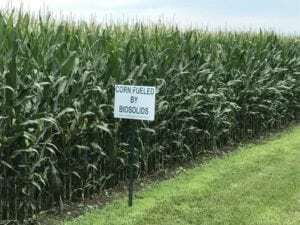 Build a strong, healthy soil structure with biosolids. One of the biggest benefits of building a strong, healthy soil structure with biosolids is good soil tilth that stores air and water and also cultivates easily. A plant’s nutrient and water is in direct proportion to the plant’s hair root mass. Compacted soils which restrict hair root development rob plants of needed nutrients and moisture. Two plants receiving the same nutrients, but with one in a weak soil and the other in a healthy soil, will show different growth rates, final size, and yield.